I read this article and found it very interesting, thought it might be something for you. 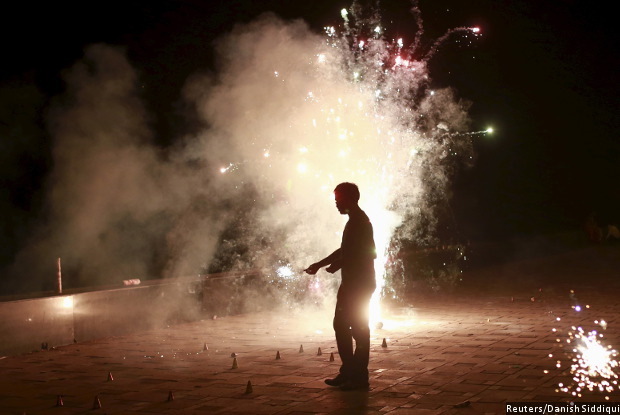 The article is called Diwali Air Over North India Was World’s Worst–And Worse Than Diwali 2015 and is located at https://archive.indiaspend.com/cover-story/diwali-air-over-north-india-was-worlds-worst-and-worse-than-diwali-2015-2015. Over the Diwali weekend of 2016, India’s air quality was among the world’s worst and between 40% and 100% worse in five north Indian cities than at the same time the preceding year, according to global air pollution data and an IndiaSpend analysis of national data and our #Breathe network of sensors. On October 30 and 31, 2016, from 9 pm to the wee hours of the next morning, North India–especially parts of Delhi, Uttar Pradesh and Bihar–recorded PM 2.5 levels of over 500 µg/m³–exhibiting “beyond scale” pollution values, according to the database run by Berkeley Earth, an independent US research organisation. 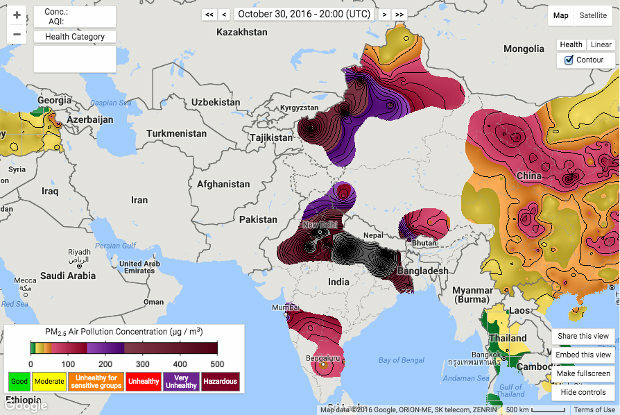 Represented through heat maps, the database typically records the world’s worst air quality–at the top of the scale, most between “very unhealthy” to “hazardous”–in dust-blown Xinjiang province in northwest China and parts of North India. PM 2.5 is fine particulate matter about 30 times finer than a human hair. These particles can be inhaled deep into the lungs, causing heart attacks, strokes, lung cancer and respiratory diseases, and are known to pose the greatest risk to human health. Their measurement is considered to be the best indicator of the level of health risks from air pollution, according to the World Health Organization (WHO). For this analysis, IndiaSpend compared 2016 Diwali air-quality data (October 23 to November 1) from our #Breathe monitors–in Lucknow, Agra and Varanasi in Uttar Pradesh, Patna in Bihar, and two locations in Delhi–with air-pollution data recorded by the Central Pollution Control Board (CPCB) in similar locations over the same Diwali period (November 4 to 13) in 2015. South Delhi’s 24-hour average PM 2.5 levels in 2016 were 38% higher than on Diwali night 2015. The next day, these levels were twice as high as the day after Diwali in 2015, crossing 650 µg/m³, 26 times above the WHO’s guideline levels, or levels considered safe. On the morning of November 1, 2016, citizens in Delhi woke up to an average PM 2.5 level of over 700 µg/m³–some of the highest levels recorded the world over and 29 times above WHO standards. The WHO guideline for 24-hour average PM 2.5 levels is 25 µg/m³. With an annual average PM 2.5 level of 122 µg/m³, Delhi’s air is the worst among global megacities with dense populations, as IndiaSpend reported in October 2016 based on WHO data. The CPCB sensors were located within a 5-km radius of our #Breathe. We observed that for the week ending October 30, 2016, PM 2.5 levels recorded by the CPCB monitors were lower than those recorded by #Breathe sensors in many instances. This variance could be attributed to the difference in location and other local climatic factors. However, the trends of variation in PM 2.5 levels over the week are similar, as the graph below indicates. Away from the national capital region, Patna recorded a 24-hour average PM 2.5 level of 437.3 µg/m³– nearly 95% higher than the levels recorded last year (224.9 µg/m³) and 17 times above WHO guideline levels. In Varanasi, while Diwali day itself recorded a 40% higher average of PM 2.5 at 247.1 µg/m³, the next day’s levels continued to soar to an average of 578.6 µg/m³, 23 times above WHO guideline levels. Agra recorded rising pollution levels progressively up to the morning of November 1, 2016, more than double the values recorded last year. Lucknow recorded a 37% increase in PM 2.5 levels in 2016 over 2015. The escalation in pollution levels this year was swifter and sharper, according to our analysis. On October 23, 2016–one week before Diwali–Varanasi recorded a 24-hour average PM 2.5 level of 96 µg/m³, nearly half the level recorded last year. Similarly, average pollution levels in Agra and the Delhi were 38% and 30% lower, respectively, than those recorded on the corresponding day in 2015 (November 4, 2015). Lucknow was 11% less polluted this year, while only Patna recorded 38% higher levels, compared to November 4, 2015. Lower wind speeds and a shorter vertical mixing layer–the height at which air turbulence can disperse pollutants–caused particulate matter to remain trapped near the surface level, according to the CPCB. With the festival arriving earlier this year, the recorded mean wind speed was 61% lower. Last year, Diwali night also registered a mean mixing height twice as high. “The level of pollutants has increased significantly in all places irrespective of parameters attributed to unfavorable meteorological conditions during the entire period,” the CPCB said in this report.